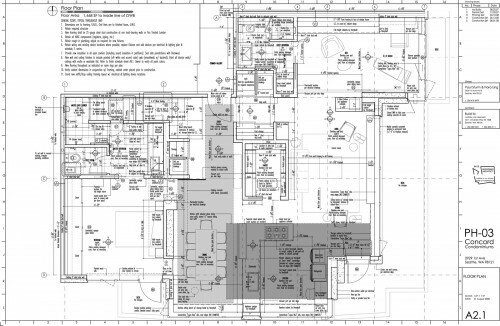 We’ve received some good questions lately about the process of architecture from the homeowners point of view. What do the different design stages look like graphically? When does the process go from diagram to actual architecture? Why do the graphics look the way they do? How does the imagery evolve and become something you can actually build from and eventually live in? All admirable questions and ones that should be better explained by us architects. Given that it takes an average of 6 years to learn the architectural design process in school and another decade to really learn how to implement it in the practice of architecture – the process can be a bit esoteric. This blog aims to communicate architecture in such a way that it’s more understandable and accessible to people. So here goes… the quick and dirty guide to the architectural process. Now take this with a grain of salt – this is just our process, it’s not the right way or the wrong way to design, it’s certainly not the only way. Put ten architects in a room together and you’ll get ten different processes (in addition to a bunch of black turtle necks and acronyms you’ve never heard of). Often a couple of architects are interviewed, the homeowner(s) and the architect(s) figure out if there is a good fit with one another. Sometimes a homeowner just knows who they want to partner with (based on a raving recommendation or a specific design philosophy, etc.) and they skip the interview step. Typically the architects have a portfolio of past projects to review and possibly examples of their process. Homeowner goals, needs and requirements are discussed. The architects visit the site, review the existing conditions and take as-built measurements of what is there (existing home/property). 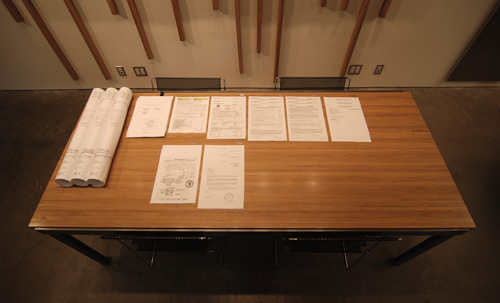 A set of as-built plans are created and a copy is given to the homeowner for their records. 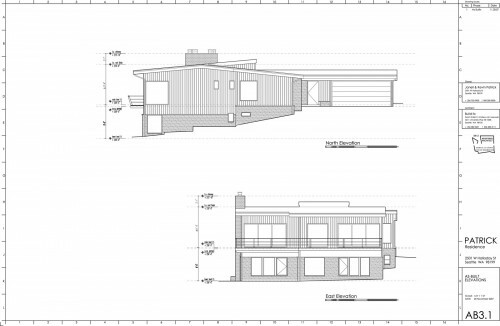 These are simple floor plans and exterior elevations – a minimal set showing what currently exists on site and nothing more. A surveyor is typically contacted at this stage and scheduled to produce a site survey – this survey is eventually incorporated into the as-built documents. 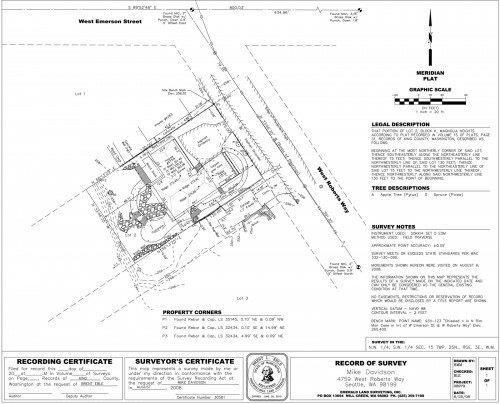 The architects visit the city/county building department to review applicable records which may include as-built drawings of an existing home; previous surveys; public records such as previous liens on the property. The architects gather information from state and city agencies regarding specific land use and building code requirements as well as pre-submittal and pre-permit procedures. The architects also create a work plan to outline what will be done and by when. 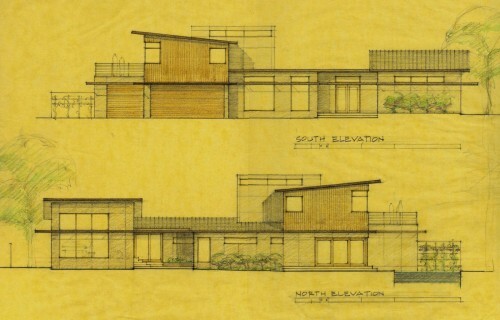 The architects generate 2-3 preliminary designs incorporating the information from step two. At this stage the architects are also bringing design concepts to the table (the stuff architects learned in school). Maybe there was a specific site feature that could be enhanced with the new architecture or opportunities within the project not previously discussed. The architects explore the sequence of how you approach the house and move through the house. How the home is experienced is a focus of this stage. 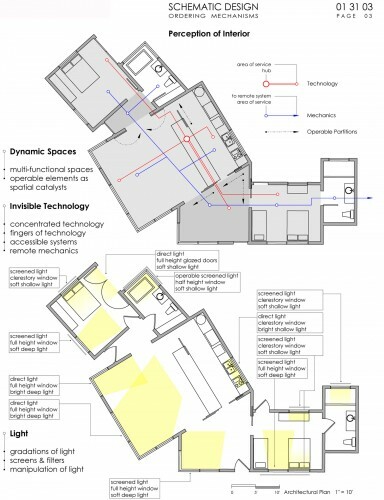 The general locations of the functions within the house are considered and graphically represented in diagram form. The graphics, illustrations and sketches are just diagrams at this stage – it’s not architecture yet. Features like windows may be added schematically or not at all. Simple plans and elevations are produced to represent relationships among spaces and the basic envelope shape (think about it like carving a simple, dumb model out of a block of clay). Material options start to become part of the discussion and a target budget is established/confirmed for the overall project. There are typically 2-4 homeowner meetings involved with this step. 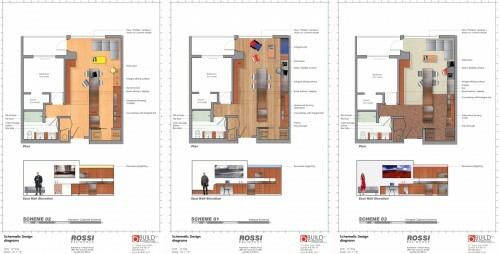 The homeowner makes decisions with help from the architects regarding the various schematic options. An overall design strategy is chosen. General contractors are interviewed and a good fit is established. Sometimes a homeowner just knows who they want to partner with (based on a raving recommendation or a specific building philosophy, etc.) and they skip the interview step. This is a great post. 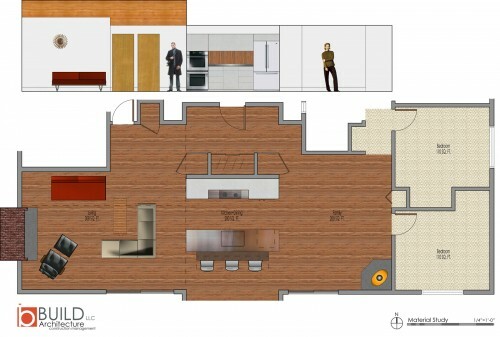 It centers on the interests and questions of the client. Nice! Great Post! your attention to detail throughout the entire process is remarkable. My favorite parts are the notebook sketches, the light study, and the “integrity of design”! Thanks Tiago. For those of you not already familiar with Tiago Rosado’s work get on over to http://eyecandy-webcandy.blogspot.com/ and check out his uber-hot Ginko project. Great post – Very good tool that I will probably use someday to explain what we do. One minor thing you said the architect will check on “public records such as previous liens on the property.” Is this something the architect should do? I think the owner should be responsible for this or else we could get sued. Useful post – I sometimes am invited to talk about Architecture at high school – and this would be a very useful tool. Is it okay for me to download the images to share with school kids? @Purnima – feel free to use any of this information in your presentations – we’re honored to be included. Great post. 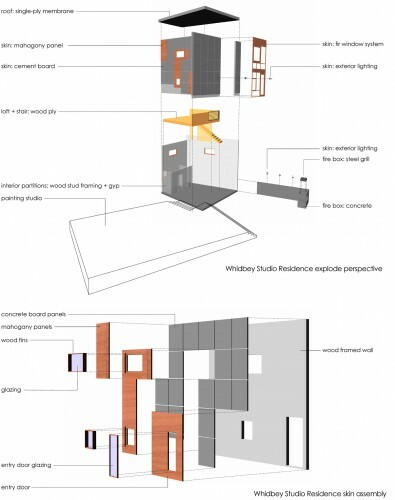 I really like the diagrammatic drawings showing the relationship of forms, spaces, and uses. Wondering what software you like best for 3-D modelling? Just found your blog – can’t exclaim enough how fantastic it is, thank you! Genevieve -we’ve been through several modeling softwares (Form-Z, Rhino, etc.) and have landed on Sketchup. Sketchup is pretty good and I heard many folks using it. Why do you prefer it to other modelling software? @JohnS -Sketchup is easier to use and it’s becoming somewhat of an industry standard. We’ve been through Form-Z, Maya, Rhino, etc. and while they’re all very powerful programs, it takes reading through a manual to learn how to operate them. Sketchup is by no means a perfect modeling application. It tends to be a bit too simple and we have a difficult time calibrating the final images without the use of add-on rendering applications. very nice , informative and good way to guide us . 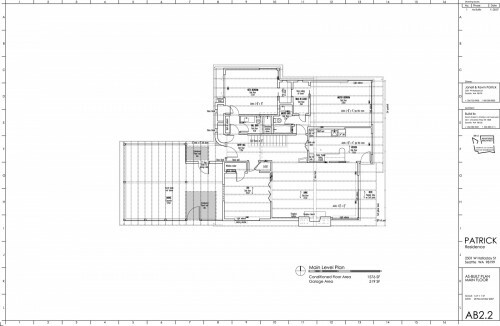 Can someone please explain the differences between Shop Drawings and Cut Sheets? Who submits and to whom? Types of information/similar information? 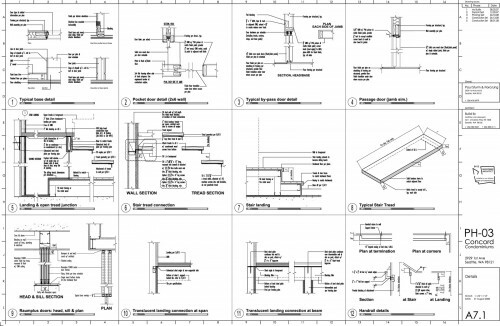 @Zachery -Shop Drawings are what the trades (cabinet makers, steel fabricators, etc) provide back to the architect to communicate their understanding of the design. These drawings are then reviewed, corrected/modified (if necessary) and constructed from. 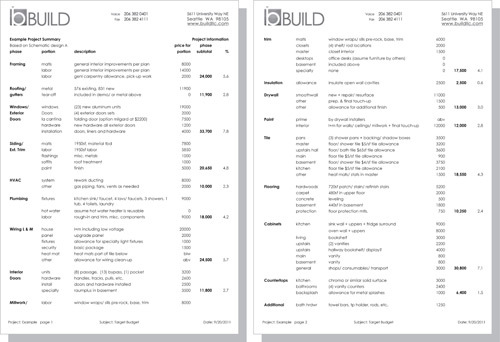 Cut Sheets are the specification sheets for items like appliances, light fixtures, plumbing fixtures, materials, etc. They typically involve prefabricated components. 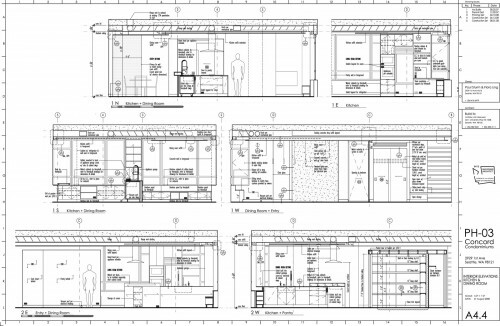 The Article explains the whole the design process from a simple sketch to obtaining a permit . i am properly prepared to due my Futuristic high Rise project now. The moral of this piece and the process of architecture is extensive planning. 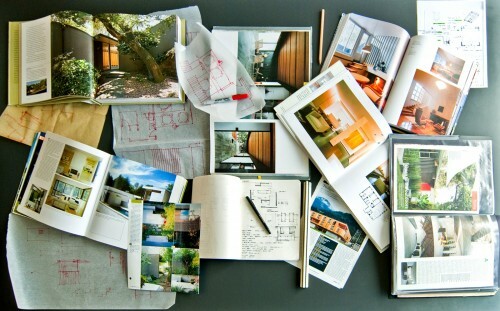 Preparation is absolutely vital for everyone involved in architecture, novices or experts alike. The key that seems to be generally skipped by many Clark County Contractors i s a complete design with details and specifications prior to actuall construction. I just completed another project where every inspector asked how i ever got a permit on the crayon on napkin design for comerical construction. . Very useful, senior in highschool and like to see what the future has for me as I have been involved in the class for years now. Truely appreciate it! Very nice post with great attention to details. Quite helpful. I love all the information you guys share… very insightful and useful as we build our small firm. Quick question, how do you integrate the permit set and detailed construction set in the field? Two independent sets? We typically provide all information on a single permit / construction submittal, but permit review these days seems to be longer and longer. I love the idea, but thinking through the logistics, as the city requires the permit set to be the record set on site and revisions are supposed to be submitted for review. @ Brandon -the permit set and the construction set are two separate sets. The permit requirements from the city are becoming so abstract and complicated, that these sets can no longer be built from. I take issue with the title you use for Step 7. The Architect does not perform Construction Administration; the Contractor does that. The Architect performs Contract Administration.